Please click this link to go to the Indiegogo page directly for more information about how you can help us with crowd funding and the cool perks you can get by helping us. http://www.indiegogo.com/projects/kabuto-focus-lever Why use Kabuto Focus? Kabuto Focus is a tool to extend your creativity adding extra abilities to you camera. Safe Time by preset markers before a Live shows, Concerts, Presentations and more. So when you film you don't have to search for focus or framing and able to swiftly change focus or zoom without having to miss your mark or important moments. Kabuto Focus. Marking ease of Focus. Easy in use because of the concave top, enabling one finger control. Visible markers from behind the camera. Fit any size lens from large Cine lenses to the smallest C-mount lenses. Transparent design enabling using the marker board on both sides. Super lightweight and will not rotate the focus or zoom ring due to its weight. Customisable Sensu Marker as we will provide an online pdf template to make your own. DIY fixing by making own laminated marker board and rubber band are easily replaceable with household ones. Kabuto Focus Lever, made from 5mm thick Transparent Acrylic. Sensu Marker Base, made from 5mm thick Transparent Acrylic. Two Pairs of UV resistant 4mm black rubber bands in sizes 85mm & 130mm. 4x Transparent Acrylic square loops for the rubber bands. Link to download the Sensu Marker PDF to customise, print and make your own Paper Sensu Marker. We made the Paper Sensu Marker to keep the cost low yet also enable to build a design that can be fixed or replaced with a customised version as we will supply a template so you can build your own. As printing and laminating would cost only a few bucks and only have to cut it out yourself. However well give you a correctly cut version inside the package, but for us to mass produce it, we have to make a cutting mold which adds allot to the cost. The Kabuto Focus plus you will get a strong Acrylic Sensu Marker which enable you put your whole camera with the Kabuto focus and the Sensu marker inside a bag without worrying of crushing or folding the Sensu Marker. The first 10 and the 35 after will have a discount on ordering each one Kabuto Focus and the more you order the more discount you get. Ask friends if they want to buy together as it cost less per set when you choose the perks where you get 2,3 or 4 Kabuto Focus then just buying one. You might think why are these cheaper, mainly sending it all to one address the shipping cost will also be to one address, instead of multiple addresses in loose packages. By hitting €3000 we can directly start producing the first batch and get it delivered to everyone fast. Literally the faster we hit €3000, the earlier we start producing and sending out the Kabuto Focus. However we will have stretch goals, which enables us to lower the production prices per unit by ordering a larger batch. However in return we will add additional gifts or parts to the ordered perks so you still be getting something that is worth what you paid for. If we hit €5.000, everyone will get an additional Paper Sensu Marker. As we would be able to order the Paper Senu Marker in a larger batch and lowering the cost. If we hit €10.000, everyone will get a black whiteboard marker. As overall cost of all the parts will be lowered. And when we hit €15.000, everyone will get an White Acrylic Sensu marker. As we will be able to order an even larger batch lowering the production cost even more and able produce the additional Acrylic Sensu Marker. Even if you like the Kabuto Focus and see potential of it helping other filmmakers, but it doesn't fit your workflow, you can still help us and other filmmakers by sharing this Indiegogo. Please share this IndieGoGo project with the share tools above to Facebook, Twitter or Google+ and we greatly appreciate your help and share. The name Kabuto Focus is actually derived from the Japanese Rhinoceros Beetle the Kabutomushi as their horn has a similar shape to our Kabuto Focus. And inspired by the beetle we were able to ad couple of features which overall improved the design. As the shape of the top now enable you to also control the Kabuto Focus using one finger and with certain rigs you can still hold the camera steady with both hands instead of freeing one to one use for focussing. We made the Kabuto Focus to possible to mount almost any lens and even small C-mount lenses. The reason for this, is that M4/3 camera's like the Panasonic, Olympus, Black Magic Cinema Pocket and the Digital Bolex can use these small lenses, but there weren't any working follow focus that fits on these small lenses. To attach it on these small lenses, use the small rubber band and wrap it extra around the inner hooks to increase the tension to increase the grip. The reason we have chosen for transparent instead of black or being colourful, is that the transparency gives it an additional function of able to use the Sensu focus marker on both sides. As we found out that on older lenses often there isn't enough space behind the focus ring, yet often have space in front of the ring. The Sensu Marker is based on the Sensu Fan which is a foldable fan from Asia. And commonly have art drawn on them, however instead of art we draw marks on them. The Paper Sensu Marker is laminated so its possible to use a whiteboard or dry erase marker on the Sensu Marker and quickly erase and change it not the next shot. We did extensive research trying out everything that is on the market, yet also looked into patent of designs that have not been produced. And have looked at mistakes and faults, but also at each functionality and searched for improvements and combining the best features to come to the design of the Kabuto Focus. Why did you choose to put this on Indiegogo? As this will be our first product that we produce under our own company and not for another companies, we wanted to be safe than sorry. And to be honest we have spend already bit more than we wanted on the development of this product as we also had a Beta Run of the product which is the black acrylic version which we made 8 high quality versions of and asked people to come and test them and also gave a set to them as gift. And as feedback we were able to develop them even further, as we didn't only asked professionals but also start ups and students. And the reason we choose Indiegogo over other crow funding websites, is that we found it more reasonable feature and also make it more accessible for most people around the world as you can pay with Paypal. You are using Flexible Funding will you be able to produce the products even when not reaching your goal? We will still be able to produce when even when not hitting the goal, however we do feel that we will be able to hit our goal and go over it. To be honest our goal of €3000 is set so we have a continues running production, however at 1000 we can already do a break even production, this means we will be able to produce,send the products and pay VAT. But means we will not have money to continue the next run and produce more. So our first real goal is to at least reach over €1000, however when we hit €3000 we will directly start producing meaning they will be able send out the products much faster and much earlier, as the Flexible Funding makes this possible. Are you taking orders internationally? Yes, we are taking international orders, international shipping outside of Europe will cost €5. If you are outside of Europe, please add an additional €5 when ordering outside of Europe. What is the 21% VAT? Kabuto Focus is made in the Netherlands and sold from here, so we have to include 21% TAX or VAT to the products. These are the rules, we don't like it either as 21% of €20 is already €4.20 that goes directly to the VAT. However we included the VAT in the pricing so you directly know how much it is. Will Kabuto Focus make it more stable for handheld use? To be honest no, also claims from other Focus Levers on the market are bringing out false claims about this and we rather give you the truth. 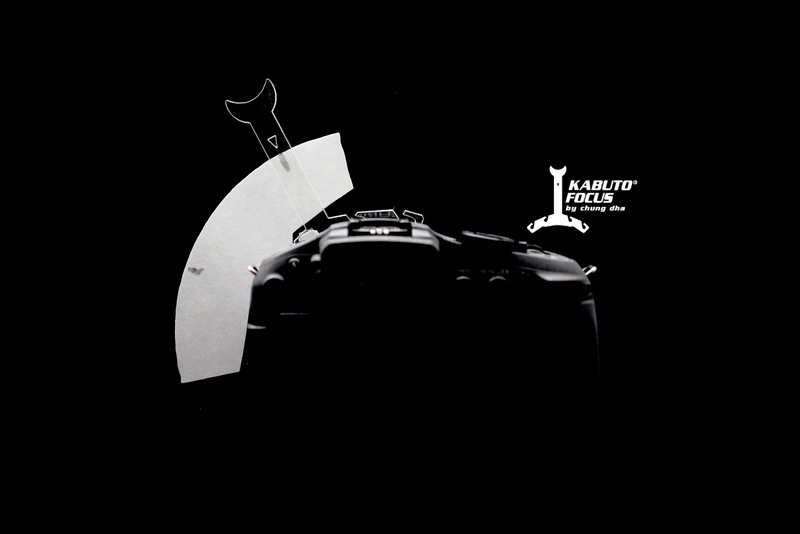 The main thing is that the Kabuto Focus is a focussing assist tool that help you with focussing and rack focussing. And we advice to get a more stable shot use a support like a rig, monopod or a tripod give you a more stable hold to your camera. Can I replace the rubber bands? Yes, if you ever misplaced or losing the original rubber band you can either replace them with any household rubber band or you can order the original black rubber bands from us for a small fee. What is the best method in making the Paper Sensu Marker? We recommend using a thicker paper of at least 150 or 200gram and print the design on them. Then use a laminating machine one its hottest temperature and to have a good adhesion put the paper with the lamination pouch several time through the laminating machine and also upside down as some design the heating element is only on one side. On a single a4 you can already make 8 Sensu Markers. Plus you can print it filled black so you people notice it even less or u can even add a logo like these below. Yes, but for it to work you would need to get this adapter from Shapeways. Will it fit the 40mm f2.8? No, as we have tested different methods and also including trying out different existing follow focus products, there seem to be no real product that actually works on them, due to the convex shape and the small size of the focus ring. Will it fit on the older 18-55mm f3.5-5.6 kit lens? Yes, however we recommend using a household thin 1.5mm rubber band which can hold it in place better. Or use it in combination with the lens hood. Do you have hard stops on this design? No, however we do recommend DIY creativity from our users using paperclips or other clips to hold onto the Sensu Marker and able to make hard stops. Can we use this on large cinema lenses? Yes but you have to use the large rubber band and for larger focus rings where it feels that both the rubber bands are too short, you can interlock the rubber bands to extend them to fit. Why us Kabuto Follow Focus when there is a $5 Follow Focus? Because the Kabuto Follow Focus actually works and also you have visible markers that are really visible from behind your camera. To see the difference watch the video below. Chung Dha is a Cinema and Design company from the Netherlands and have filmed videos for big companies like Red Bull, Pizza Express, Starbucks and more. But also have won awards at different short film competitions around the world and have films screened in Hong Kong, The Netherlands and San Francisco. Our company is adding a new direction of designing and producing film equipments, as we often build different grips and handle all kinds of professional equipments, but every so often we build something special that we think that everybody should use.